More feudalism from Spoleto: Elizabeth Brown where are you now? Larry Swain did ask me to write more about this Spoleto volume, and what with him and the debate I seem to have got started with Another Damned Medievalist, I suppose there’s an audience of at least two for this post. I’ll try and keep it brief, though, because even for me it’s quite dry, and basically there’s only so many times I can illustrate a post with ye olde feudal homage illumination, so I have to keep myself limited on the number of posts where I actually talk about it. Sometimes you have to wonder whether Elizabeth Brown should have bothered. Spoleto draws a very European crowd, obviously, and especially among them Italians and Germans. Therefore, in the middle of this volume is a clutch of German and Italian papers that make up quite a lot of its weight. Of these the weightest is by Hans-Werner Goetz and I’ll come back to that in another post, if at all, because it’s doing something different to the following four.1 These four, Piero Brancoli Busdraghi, Amelio Spicciani, Hagen Keller and Gerhard Dilcher, are all basically arguing about the content of relations between lords and their soldiers at different points and periods.2 Busdraghi, Spicciani and Keller all cover Italy, though of these only Spicciani really comes south of Lombardy and Keller gets good ground out of comparisons with Germany. Dilcher is different in that he focuses on Germany, and under the Salians and Staufen kings whereas all the others are paying attention to the eleventh century most of all, and Spicciani again earlier too where it’s useful. I think Keller’s is the most subtle and Spicciani’s the most empirically justifiable, but the basic question is the same: how feudal is it all? And this would be enough to make many people quite frustrated, because as I mentioned in 1974 Elizabeth Brown asked us all to stop that. It is not quite basic and unmodified as some of the work she was contesting. As Chris Wickham said at this same conference, people do get their models of feudalism confused, but even when you’re clear about what you’re looking for, the human variation involved in society makes it a lumpy fit. All of these scholars were, either explicitly or implicitly, working with a juridical definition of feudalism that more or less limits it to military arrangements made between lords and soldiers paid for with temporary land grants, but they weren’t being quite as simplistic as “is my model visible here?”, because That Never Works. Instead they’re conceptually working at one remove, where the question is, “what is going on in my area that makes it distinctive in its transition towards feudalism?”, which lets you use the local variations to try and explain why your area is such a lumpy fit to the model. It is, however, still working with the model. How does this look in practice? Of the four papers here, two particularly address a particular document of 1037, and the other two use it as an endpoint or starting point. The document is an edict of Emperor Conrad II that was intended to end a two-year uprising by the lesser vassals of the kingdom of Italy (which, you may need to know, was the north; of the south, which was nothing like as coherent, we’ll hear another time). 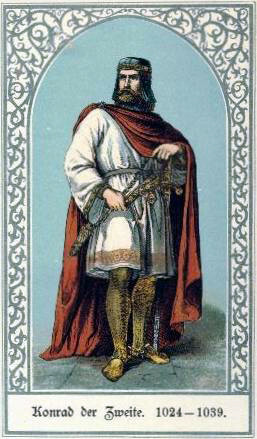 The vassals were up in arms because they felt in danger of not being allowed to succeed to benefices that the lords had given their fathers; their expectation was that the “ius patrum suorum” should be continued in their hands, and Conrad went some way to setting rules for this that had not, previously, existed in a way anyone could rely on. This was good for his image as lawmaker and peacemaker and, Dilcher argues, more or less left Germany out of it, where such rules came, if at all, with the Roman law revival of rather later and on a background of long-developed German, not Italian, custom. But Dilcher’s focus is later, so his paper starts with this Edict; meanwhile, Brancoli Busdraghi’s ends with it and it forms a constant background to Spicciani’s and a frequent partner in the dance through concepts and practices that forms Keller’s contribution. It’s obviously a fascinating document and a good place to focus all their sorts of enquiry.3 So Brancoli Busdraghi finds that it plays substantially to the interests of the powerful, because although it does make it harder for them to arbitrarily remove their followers’ sons’ livelihood (which is, Spicciani emphasises, what it will have meant in some cases) it also fixes those followers in dependent service, removing their options too. Spicciani reads it in quite the opposite way, seeing the combination in pursuit of a ‘class’ interest as an indication that the lords are more or less at the mercy of the mob here and stressing the skill of the compromise that Conrad finds. Keller asks, somewhat incredulously, how a simple law could apparently resolve such social tension, and argues therefore, Barthélemy-like, that what is really happening here is orally-transmitted expectations being made concrete but that were already pretty general; Conrad therefore restores order by recognising it and only a few people have to change their practices. This somewhat fails to explain the uprising in the first place, and Spicciani’s strength is in explaining it, but Keller has much to say about how writing could exaggerate the importance of things simply by bringing them to the fore of our attention. He cites some English work for this. In this he is unusual, but there is one work they all cite, and it’s not Brown but Reynolds.4 In a sense, they have to, because she goes for the Edict among the many other sources she considers misrepresented or unrepresentative. Against her argument that basically all the evidence for the model at issue is late and at least slightly wrong, Dilcher and Keller both claim at different levels of subtlety that oral practices underlie these later reflections so that really, the system is there beforehand but not evidenced in writing. In this way they avoid dealing with any of the rest of her criticisms about the model itself, or any of Brown’s. None of them cite Brown. But what they are doing, despite its actual historical content, is setting papers around the question of how much logic-chopping you have to do to retain the feudal model in the case of their areas. Does it really help? Is it not more interesting that the Romagna and Lombardy do power relations in different ways, and to explore why that is and what effects it has, than merely trying to work out at what different points they move onto a ‘feudal’ base? It helps me less to be told, with a considerable backing from almost entirely secondary sources—Spicciani’s demonstration of variation in other areas is a breath of fresh air but he is still basically discussing other historians, not the sources, and the others use even less primary material—that the passage to feudalism was more or less influenced by written law and Italian custom, than it would to be told how this lord and that lord organised their armies and whether it was significant for their status and effect, if it worked, and so on. I don’t think ‘is it feudal or not and if not why not?’ is useful to us most of the time, because if what we are finding is that ‘feudal’ is a category that doesn’t fit easily then its explanatory value is strongly diminished. And you know, Brown said that in 1974 and twenty-five years later Reynolds’s work, by attacking on so many fronts that some of them had to be defensible, was here actually making it easier to ignore what Brown and she were saying in common. I could wish Brown had been at the conference and able to speak her piece; apparently it still needed saying. 1. Hans-Werner Goetz, “Staatlichkeit, Herrschaftsordnung und Lehnswesen im Ostfräkischen Reich als Forschungsprobleme” in Il Feudalismo nell’alto Medioevo, Settimane di Studio del Centro Italiano di Studi sull’Alto Medioevo Vol. 47 (Spoleto 2000), I pp. 85-148. 2. Piero Brancoli Busdraghi, “Rapporti di vassallaggio e assegnazioni in beneficio nel Regno italico anteriormente alla costituzione di Corrado II”, ibid. pp. 149-173; Amleto Spicciani, “Concessioni livellarie, impegni militare non vassallatici e castelli: un feudalesimo informale (secoli X-XI)”, ibid., pp. 175-227; Hagen Keller, “Das Edictum de beneficiis Konrads II. und die Entwicklung des Lehnswesens in der erste Häfte des 11. Jahrhunderts”, ibid. pp. 227-261; & Gerhard Dilcher, “Die Entwicklung des Lehnswesens in Deutschland zwischen Salier und Staufern”, ibid. pp. 263-308. 3. It is edited, should you be interested, in Harry Bresslau (ed. ), Die Urkunden Konrads II. mit Nachträgen zu den Urkunden Heinrichs II., Monumenta Germaniae Historica (Diplomata regum et imperatorum Germaniae) IV (Hannover 1909, repr. 2001), online here, doc. no. 244. 4. I only just gave these references, it seems, but, for completeness: Elizabeth A. R. Brown, “The Tyranny of a Construct: Feudalism and Historians of Medieval Europe” in American Historical Review Vol. 79 (Washington DC 1974), pp. 1063-1088, repr. in Lester K. Little & Barbara H. Rosenwein (eds), Debating the Middle Ages: issues and readings (Oxford 1998), pp. 148-169; Susan Reynolds, Fiefs and Vassals: the medieval evidence reinterpreted (Oxford 1994). This entry was posted in Currently reading..., Feudalism and tagged Amelio Spicciani, Elizabeth Brown, Feudalism, Gerhard Dilcher, Hagen Keller, Hans-Werner Goetz, medieval Italy, Piero Brancoli Busdraghi, Susan Reynolds. Bookmark the permalink. I didn’t se this coming, but a lot of your recent stuff is suddenly making a lot of sense to my work. Actually (by some bizarre coincidence?) everything you’ve blogged in the last few weeks fits snugly in there. Yes, even in a way the Fictional museum (talking about the bizarre!). Good lord man, what on earth are you working on? :-) I’m guessing the Fictional Museum bit has more to do with your current employability? Thanks for humoring me, Jonathan. Keep it coming! Wearing editor hat again…..be in touch. Well, no, it’s actually more that it makes me think along new/unexpected lines. Well, I’m glad it’s being useful to someone, as my readership has about halved since I started this Spoleto series! But I’m putting that down to the start of semesters in the USA. Who doesn’t love highly technical discussions of feudalism, after all? Well, the semester is why I’ve not been around as much … but yeah … a dangerous thing to get bogged down by whether or not it’s feudalism. Why not just say what’s there, and let it be what it is? OK Jonathan, I can reveal this much: I’m looking into the workings of interpretation of “power” and “status” the archaeology of 8th-13th century Denmark. The scary-funny thing is that everytime I lose my concentration just a little bit it all turns so awfully feudal in a (pre-)Reynolds way. More specifically there is a range of explanations (in previous scholarship) that really don’t explain anything at all. It’s all so very descriptive and when it comes down to contextualising and framing the (I admit it, very fragmented sources) – whoa! hey! – we’re all of a sudden talking ottonian-or-carolingian-it’s-all-been-said-before-feudal ‘stock explanations’. Applied to the archaeological record of course. So, for example, certain kinds of gold gadgets are ascribed to a “warrior class” or “feudal magnates”, certain types of buildings are (maybe even rightfully so) described in terms of aristocracy and power holders and nothing is really explained anyway. Ah, yes, I see, one of those cases where the interpretative paradigm the archaeologists would like from the historians has crumbled while they were out digging. If you can clamber your way through all the wreckage, though, you may be in a powerful position to build a new model. As I understand it `high-status’ buildings and goods are a problematic thing because that judgement is very subjective. I went to a paper by Chris Loveluck a few years ago where he said that supposedly high-status goods had been found at so many places along the English east coast that the term just had no meaning any more and needed new criteria (he suggested dolphin bones). So finding high-status people’s remains is a problem in itself. On the other hand, however they related to each other, you can be fairly sure that there were some high-status people. Whether the warriors are really a class or not is something that you don’t really need, I think; their common interests don’t matter as much as their individual interests. Instead you could work more holistically: what is the rôle of a warrior in the cultures you’re seeing, who else exists that he must relate to? The trouble is that the prehistoric archaeologists have it all more or less worked out from around 200 AD which is really frustrating, because when they try to make the connection to, say some of the decent written sources of the 13th century, like the place names in liber census daniae, they’re effectually stepping on to the turf of historians, ’cause the medieval archaeologists arent’ listening… or looking, for that matter. And theyre jumping over 2-300 years of history while they’re at it. But hey, dolphin bone! That’s a new one! But no, there really aren’t any good introductions to the ‘background to the Vikings’ – Randsborgs book was interesting at the time of publication (1980) but I consider it rather outdated. It has some good ideas, though. Fabech, C. & J. Ringtved (eds. ): Settlement and Landscape. Proceedings of a conference in Århus, Denmark, May 4-7 1998. Højbjerg 1998. Jørgensen, A.N. & B.L. Clausen (eds. ): Military Aspects of Scandinavian Society in a European Perspective, AD 1-1300. Papers from an International Research Seminar at the Danish National Museum, Copenhagen, 2.4 May 1996. (Publications from The National Museum Studies in Archaeology & History Vol 2). Copenhagen 1997. And I also evaded your question: No (danish) historians that I know of do any serious research on the time before c.1100 AD (in Denmark). No charters – no fun. That said, I read something about this a while ago, by Niels Lund, in a book I then reviewed; I guess there is some work when one starts to dig for it? There must be something, yes. Nils Lund is one of the few engaged in the area – but we’re still waiting for the grand historical treatment of the period. I think most research these days is coming from the outside and looks like Simon Couplands piece in Early Medieval Europe (1998,7(1), p.85-114. -And a very good piece it is).